Bayern Munich were crowned Bundesliga champions for the fifth straight season on Saturday after Robert Lewandowski scored twice in a 6-0 thrashing of 10-man Wolfsburg. After second-placed RB Leipzig were held to a goalless draw by Ingolstadt, Bayern wrapped up the title with a thumping away victory that left them 10 points clear with three games left. “Five times in a row, that’s unbelievable. We completely deserve to be champions,” Bayern chairman Karl-Heinz Rummenigge told Sky. Carlo Ancelotti has delivered a 27th league title in his first season as Bayern’s head coach. “I am very happy, this win was important and it’s a fantastic experience,” said the Italian. Ancelotti has now won four national league titles after also lifting the Premier League with Chelsea, Serie A with AC Milan and Ligue 1 with Paris Saint Germain. Lewandowski’s brace leaves the Polish predator on 28 goals this season, one more than Borussia Dortmund’s Pierre-Emerick Aubameyang in the race to be the league’s top marksman. The league triumph is consolation for Wednesday’s 3-2 German Cup semi-final defeat at home to Dortmund, which denied Ancelotti the chance of emulating predecessor Pep Guardiola with the domestic double in his first season. It also goes a small way towards making up for the disappointment of going out in the quarter-finals of the Champions League to Real Madrid. Bayern were barely made to work for their win as David Alaba drilled home a trademark free-kick on 19 minutes to put the visitors 1-0 up after a foul on Thomas Mueller. Lewandowski doubled the lead on 36 minutes when Kingsley Coman’s cross was flicked on by Mueller and the Poland hot-shot fired home. He bagged his second and Bayern’s third just before the half-time whistle after Coman delivered another cross from the left wing. 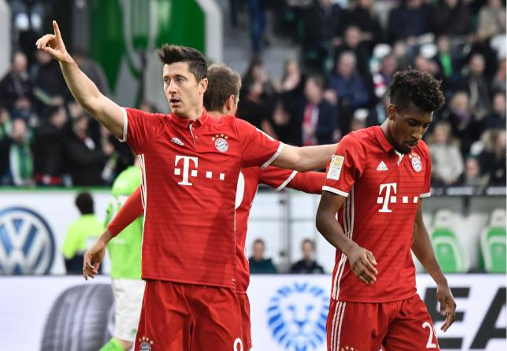 The floodgates opened late on as Arjen Robben netted on 66 minutes before Wolfsburg’s Luiz Gustavo, a former Bayern player, was sent off for a second booking on 78 minutes. Bayern exploited their numerical advantage as Mueller banged home Lewandowski’s pass before Joshua Kimmich sealed the rout. Bayern’s latest comfortable title win was made possible by Leipzig’s draw at the Red Bull Arena, where Ingolstadt defender Alfredo Morales was sent off with four minutes to play. Dortmund, who face Eintracht Frankfurt in the German Cup final on May 27, hold on to third place, which would mean a direct Champions League place next season, despite their goalless draw at home to Cologne. Both Aubameyang and Cologne’s Anthony Modeste, who has 23 league goals, drew blanks at Signal Iduna Park. Hoffenheim, coached by Julian Nagelsmann, 29, the youngest coach in Bundesliga history, can leapfrog Dortmund if they beat Eintracht in Frankfurt on Sunday. Werder Bremen’s remarkable finish to the season continues as they earned a 2-0 win to home to Hertha Berlin to stay sixth. Bremen remain on course for a Europa League place having risen from bottom in September after losing their first four games. Werder striker Max Kruse’s dream April continued as he netted Bremen’s second after Fin Bartels’s opener for his eighth goal in six games this month. Bremen are unbeaten in their last 11 games. Mainz remain just a point from the bottom three after Japan striker Yoshinori Muto scored their consolation goal in a 2-1 home defeat. Lars Stindl and Nico Schulz scored for Borussia Moenchengladbach. Plucky bottom side Darmstadt again delayed their relegation with a 3-0 win at home to Freiburg. Torsten Frings-coached Darmstadt picked up their third straight victory thanks to goals by Felix Platte, Jerome Gondorf and Sven Schipplock. Darmstadt are still eight points from safety with three games left.